No insurance, no helmet needed, no numberplate and permission to sidewalks, pedestrian areas. "Use this products to get your mobility back and even epand your range and possiblities!" 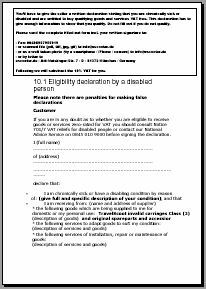 IF YOU ARE A UK CITIZEN AND GO FOT VAT EXEMPT YOU CAN CHOOSE AS THE SUPPLIER COUNTRY "UK VAT EXEMPT" AND YOU WILL FIND THE NET PRICES IN THE CART! For all-season use Protects against: weather (water, dust and dirt) damage (scratch, stone impact) cold (more capacity by heat storage) and it looks good! Made of 4,5 mm thick laminated Neoprene for best insulation. Foldable Shopping Basket The foldable basket can be mounted both front and rear. The basket dimensions are 9 Inch (23 cm) deep x 13 Inch (33 cm) wide x 8.6 Inch (22 cm) in height. It can hold about 15 lbs (7 kg). Leg protective jacket Artificial leather, tough material with warm lining, black. 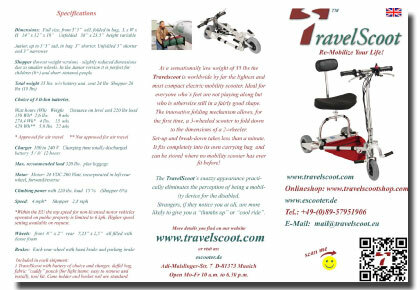 Upgrade from the already comfortable xl sized normal TRAVELSCOOT seat system to the even bigger XXL seat system for persons that are particularly stout with higher weight in connection with smaller stature. ...accessories parking brake lever for fixing the brake - please choose left or right in driving direction. 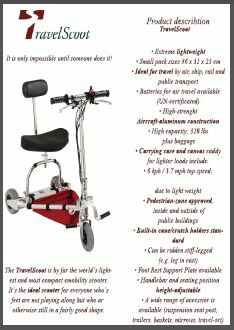 Orignialmotor streetlicensed version Travelscoot 150 Watt as used with models built up to the year 2012. Compact and leight weight lithiumbattery with 205 Wh for about 13 km / 9 mls range with only 1,47 Kg (fitting TravelScoot lithium charger necessary articlel 10814).